Afro- Euro Hi-Late Magazine is published in order to reach the widest audience possible and in order to get its information well circulated and disseminated, the organisation run a public relations department which run all the issues pertain to having the ideals and projects of the organisation be made known to the community. The department develop policies for positive media coverage for Afro Caribbean and Asia affairs in order to counter-act the biased reporting and media portrayal of issues relating to the third world. It also run other publications relevant to the work of the organisation as the need arises. Besides the print media, we make use of other forms of media such as the internet whereby a website for promoting Afro-European interests and endeavours also run. The organisation develop a public relations policy aimed at reaching the black community in Europe and all over the world, stimulating the black community to the development of their country of origin and to eventually create an Afro-Euro Social Service Database for the collection analysis and dissemination of information relating to black activities and projects. The Public Relations department run and supervise the website of the organisation. 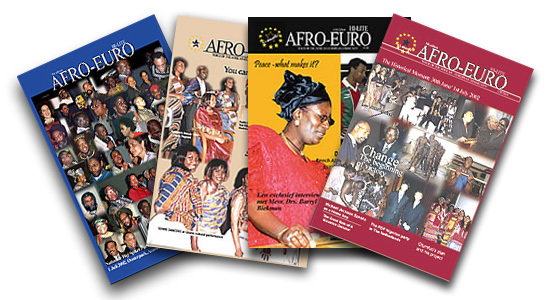 Its aim is to have an AfroEuro Database of Black Professionals, the AfroEuro Social Service Database and all information relating to the organisation and its worldwide network.